You know that moment when your mind is suspended for a brief but crucial moment? It happened to us in Queenstown, one of our favourite places in New Zealand. Without thinking twice, we very spontaneously drew the credit card and booked a helicopter flight over Queenstown. Not even three hours later, we were pulling back our seat belt straps, adjusting the oversized headphones and preparing for take off. We’ve done a lot of crazy things in the last few years of travelling, but flying over Queenstown by helicopter was one of the craziest, most thrilling experiences ever. Ready for a huge dose of endorphins? Then read on. 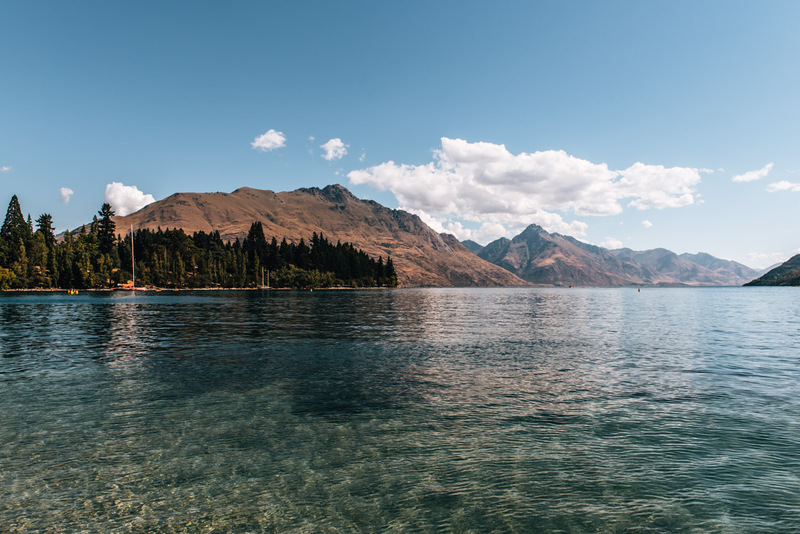 We have also included our best travel tips for the scenic Queenstown and its surrounding areas. 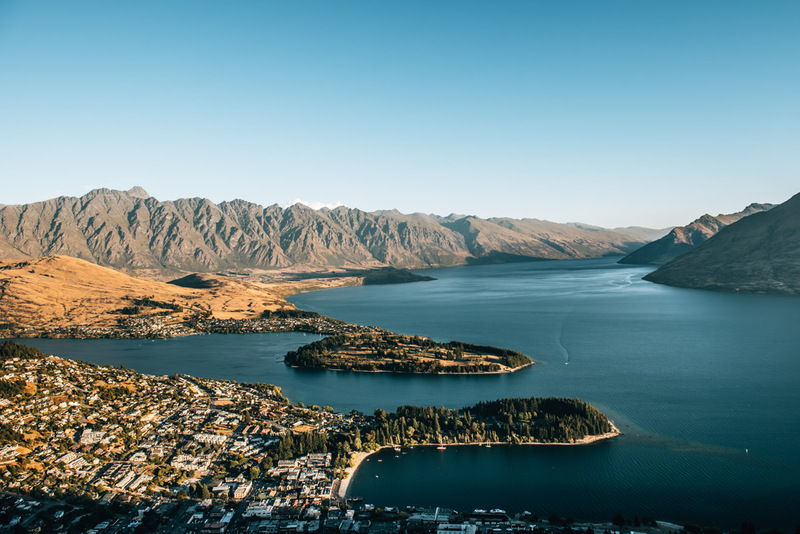 In our honest opinion, there are very few cities in New Zealand that are as beautiful as Queenstown. We fell head over heels in love with this little corner of the earth on our very first trip to New Zealand. 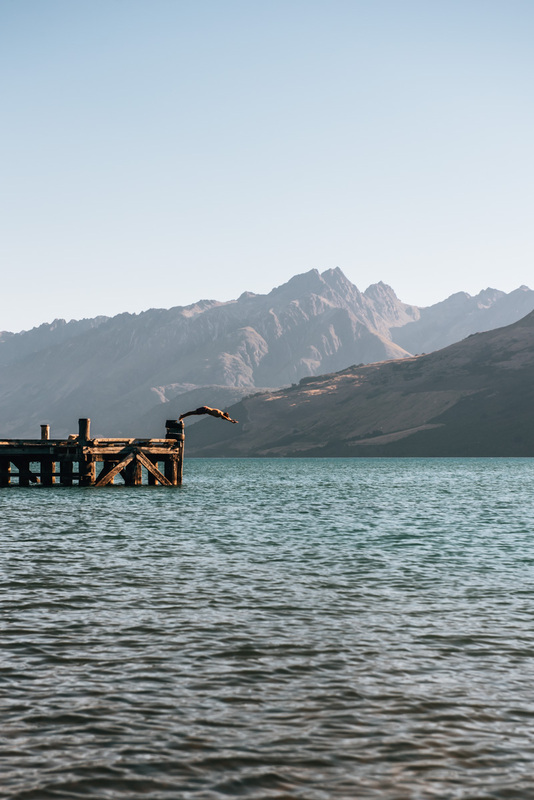 The combination of the striking blue lake and the spectacular mountain ranges of the Remarkables, leaves us in awe at the beauty of this planet. 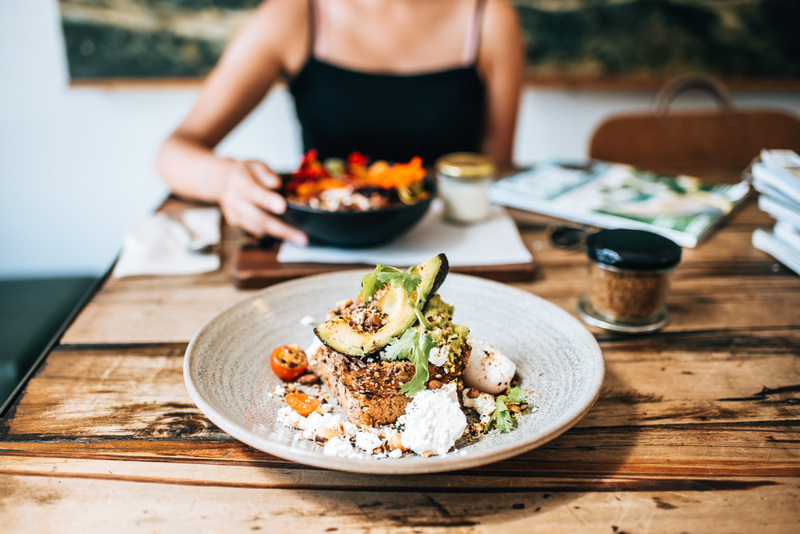 Unlike most of the regions in the South Island with their modest towns, Queenstown is an extremely buzzy place with an astounding variety in culture. People come from all over the world, some live and work here, while most are passing by on vacation. Here you will find plenty of cafes and restaurants and in the evening you can party in the bars of the main street. The small beach by the town centre is used by locals and tourists in summer for a quick refreshing dip. 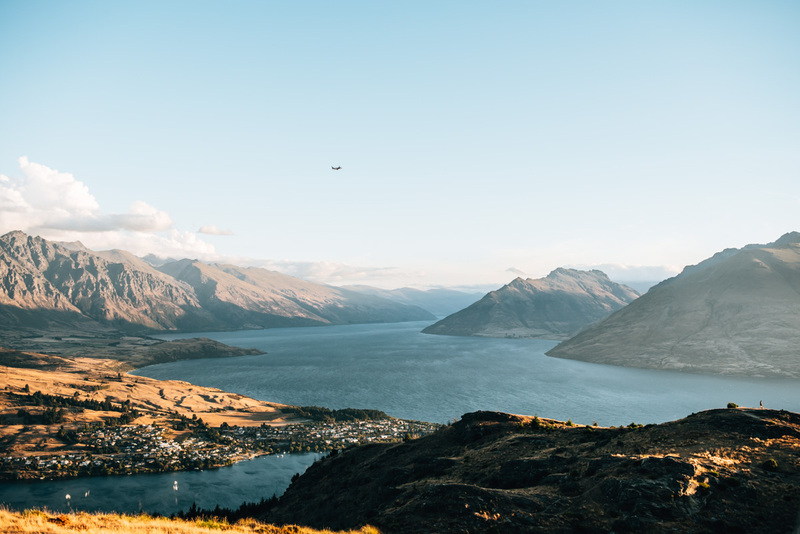 Twice already, have we visited Queenstown during New Zealand summer with five years in between and we can confirm that Queenstown has indeed become much more touristic – and by quite a margin. Almost every corner you can hear someone speak German and Asian travel groups have become far more prevalent. Not that it matters, because for us Queenstown is still one of the most beautiful places in New Zealand. What else does Queenstown offer apart from the spectacular nature? Well, nowhere else do travellers partake in such adrenaline rushing activities like they do in Queenstown. 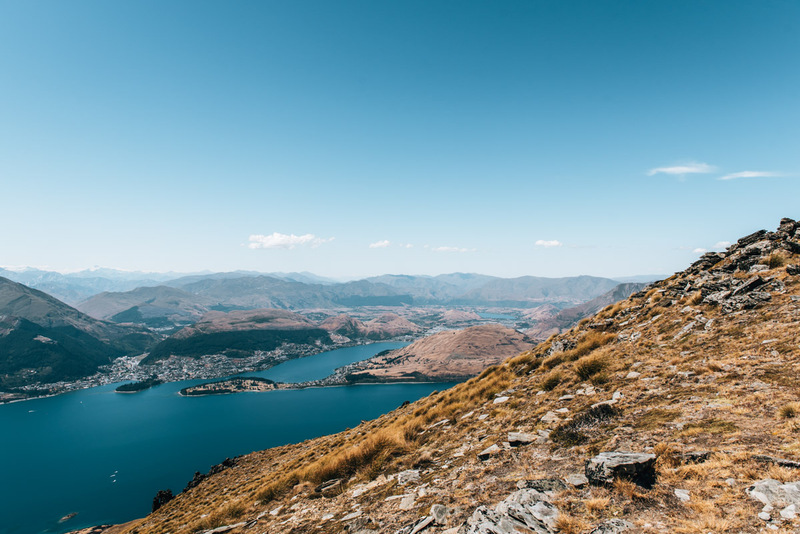 Even we don’t know the extent to what that entails, but no matter what kind of extreme sport you are considering, you will most likely find it in Queenstown. From paragliding to skydiving, to the famous bungee jumping – this place has everything. Both our visits to Queenstown have been in January during New Zealand summer. January is usually the warmest month with average daytime temperatures of 20 degrees Celsius. However, on both visits, we had temperatures up to 30 degrees. This is not granted, of course, as always with New Zealand weather, it is difficult to say and can change so suddenly. With a bit of bad luck it can rain for days in summer. In winter (June, July and August) Queenstown is a popular ski destination. There are several ski resorts in the area, so you can try your hand down the slopes of “The Remarkables” mountain range. Coronet Peak and Cardrona Ski Fields are also popular skiing destinations nearby. Helicopter flights are still possible in winter as well. We had butterflies in our stomach at the thought of a helicopter flight. Such an experience has tempted us for years, but we had never actually dared to do it… until this fateful day. We were standing clueless at the tourist information in Queenstown, itching for something exciting to do. It was 25 degrees, bright sunshine, no wind – and in the next second it hit us: it was the perfect day for the first ever helicopter flight of our lives. The moment had come. Not even three hours later, we took off and felt an adrenaline rush we had never experienced before. Scotty, our pilot, pulled up the lever, made a left and then manoeuvred the helicopter across Queenstown Airport before heading up into the mountains. The first few seconds of our flight felt so surreal. 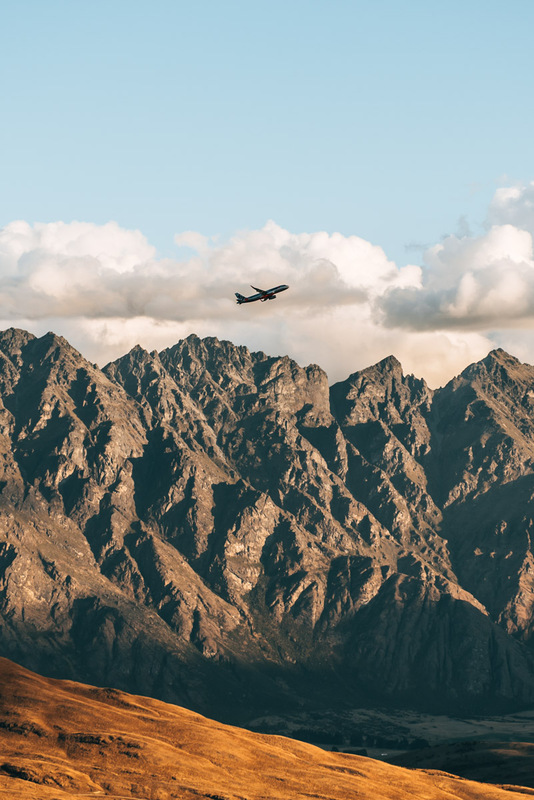 But it got even crazier: We landed in the middle of nowhere, on an abandoned rocky summit in the mountains, and when we got out… Queenstown was at our feet. 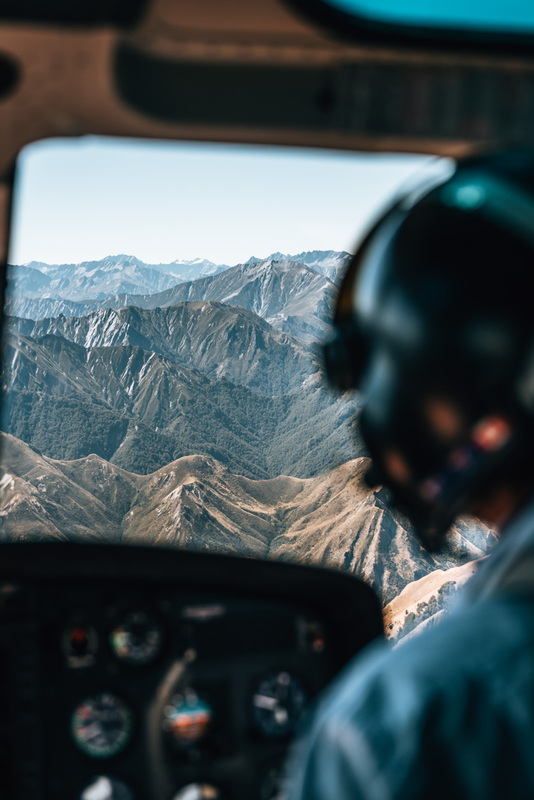 Not only does Queenstown offer a variety of providers for helicopter experiences, but also different types of flights. These vary in the duration, the route, the number of stopovers and of course the price. We chose a flight that lasted around 35 minutes. This was actually not the shortest option but we opted for a flight that landed in the mountains, whereas the shorter ones usually omit any stopovers and just fly a round trip. If you are unsure about which helicopter experience, then we can highly recommend the flight plan we went with. We felt it was great value for money. “The Helicopter Line” was the company provider we went with and “The Grand Circle” was the scenic flight we chose to do. 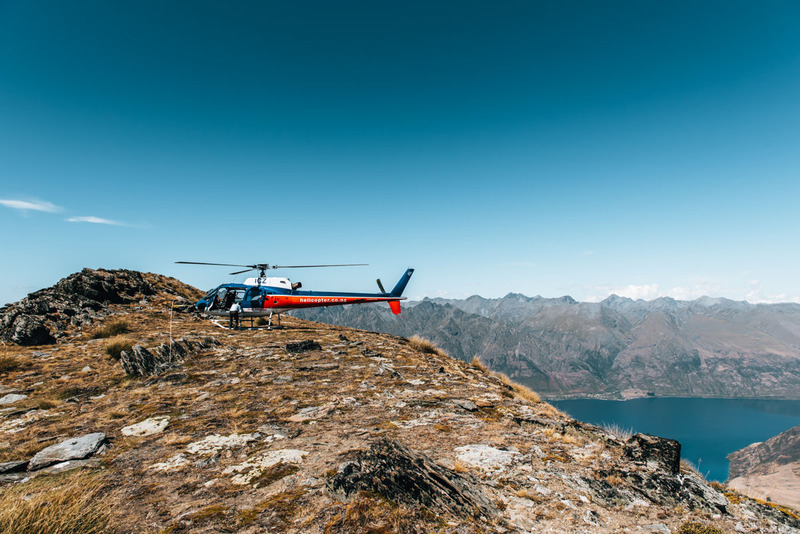 “The Helicopter Line” offers flights all over the South Island and gave us a very professional impression. 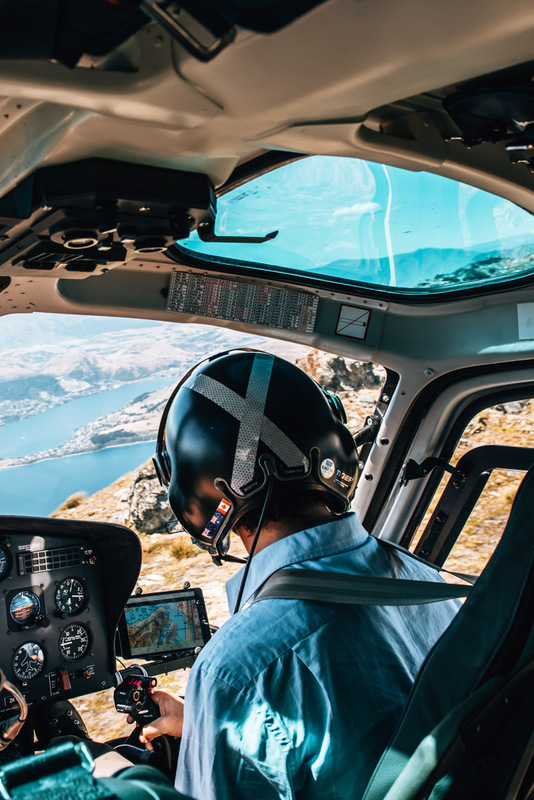 In order to maximise flight time perhaps, the briefing did feel a little rushed, but you will also notice that helicopter flights in Queenstown are on very tight time schedules. As soon as we touched down, the next group was already waiting to board their flight. Another company that was recommended to us was “Glacier Southern Lakes Helicopters”. On Tripadvisor, this company ranks higher and the flights offered are also quite similar to the provider we went with. The good-ish news is that although helicopter flights are not a cheap experience, they are also not so unaffordable. We paid about 200 euros per person for our 35-minute flight and honestly, the flight was worth every cent. If you choose a longer flight plan then a helicopter experience becomes a very expensive endeavour. For example, a flight from Queenstown to Milford Sound costs about 500 euros. Unfortunately, you are not allowed to choose your seats because the helicopter will be loaded according to weight. That’s why you’ll be weighed right before the flight. Most helicopters have two people in the front and four in the back (in a row). Unfortunately we weren’t lucky enough to be in front, but even from the rear, the visibility was good – even the two middle seats at the back enjoyed a nice view as the helicopter is glazed in all directions. Whether or not take off will happen, can only be confirmed about an hour before the commencement. As there might be a slight chance the helicopter flight will be cancelled due to the weather, you should brace yourselves mentally for this worse case scenario. Most providers therefore want you to contact them shortly before the flight to clarify the weather situation. A cancellation is of course very annoying, but they have to put safety first. On the bright side, you would get a full refund in the case it were to be cancelled by the the provider. The airstrip from which the helicopters depart is located on the outskirts of the city. 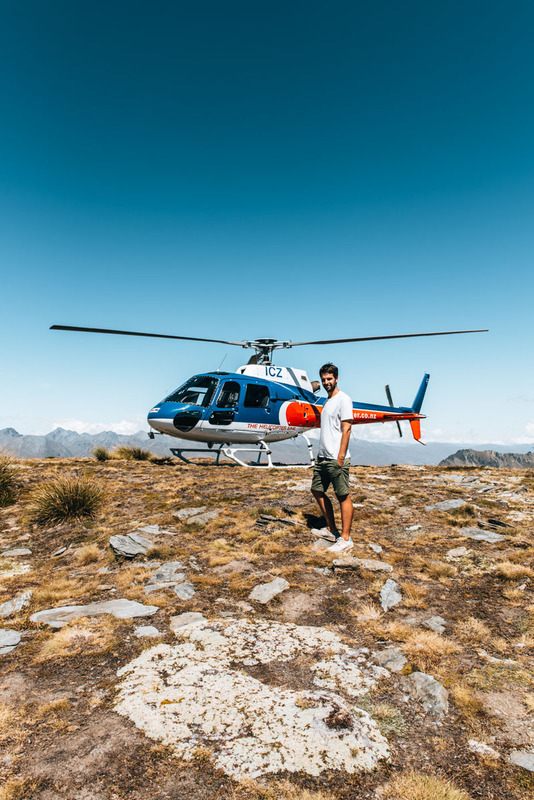 Most providers (including Glacier Southern Lakes Helicopters and The Helicopter Line) include free pickup from your accommodation in Queenstown. We highly recommend you to hike up Queenstown Hill for the sunset. This is a bit of an insider tip, because almost all visitors skimp this hike in favour of the famous gondola on the neighbouring mountain. The trail takes about 1.5 hours and leads you first through the forest and then over open terrain on the Queenstown Hill. From the top you can enjoy a spectacular panoramic view of Lake Wakatipu and the surrounding mountain ranges. 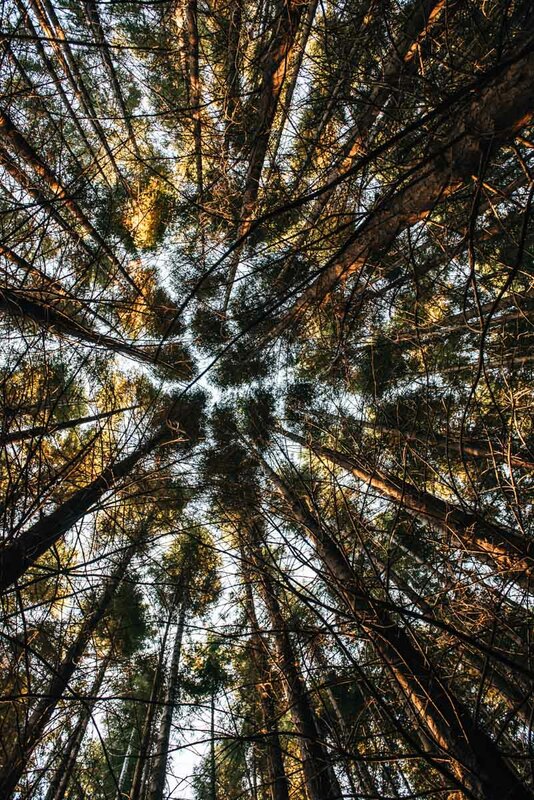 Our tip: Go all they way to the very top! Some make the mistake of ending the hike at the viewing platform with the sculpture called “Basket of Dreams”. But keep going, it’s so worth it! There is about 500 metres of altitude to conquer in order to reach the summit, however, this is very manageable, even for those with low-medium fitness level. We decided to stay and watch the sunset, which was spectacular, but that meant the last stretch of the trail was made in the dark. But we weren’t too worried as the track itself is not very demanding and with a headlamp or mobile torch, it’s quite easy to find your way back, even in twilight. 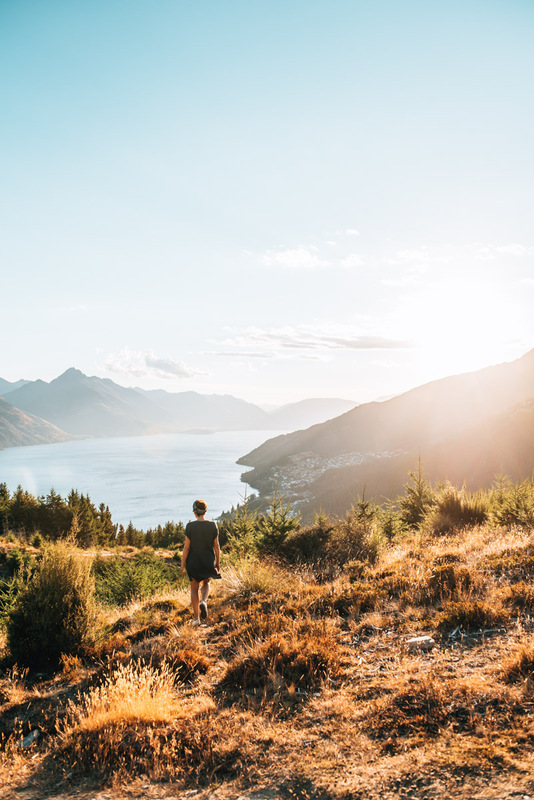 In principle, you can start the Queenstown Hill hike from the centre of Queenstown. To save you the first, rather tedious 25 minutes through the streets, we would recommend driving to the small car park on Belfast Terrace. 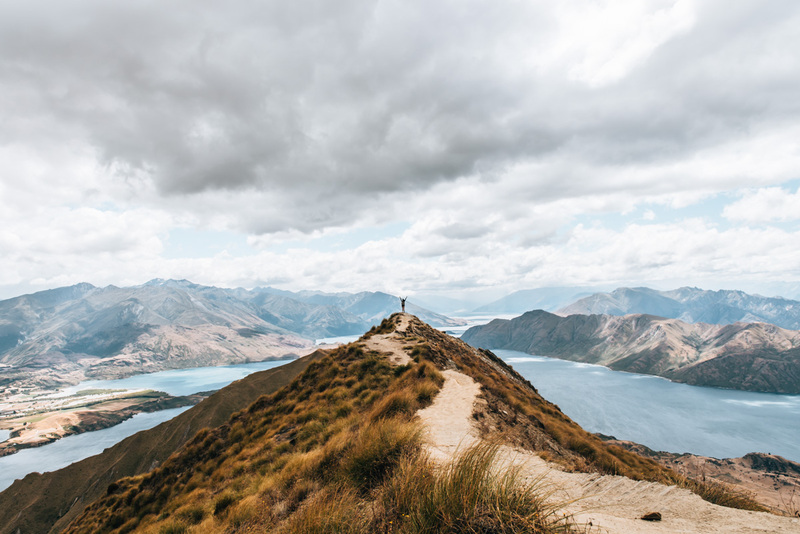 You can find more information about this and other walks in New Zealand in our blog article: The most beautiful day hikes in New Zealand. 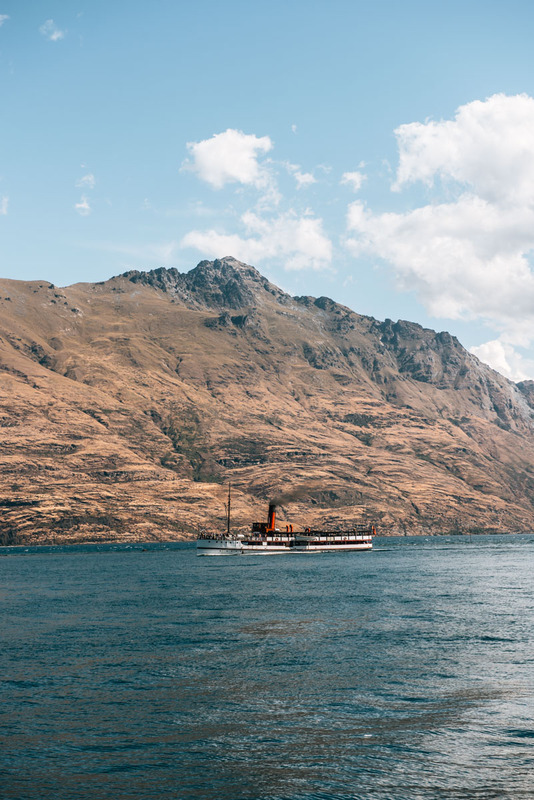 A 5-minute gondola ride to Bob’s Peak is a standard program for anyone coming to Queenstown. And rightly so. 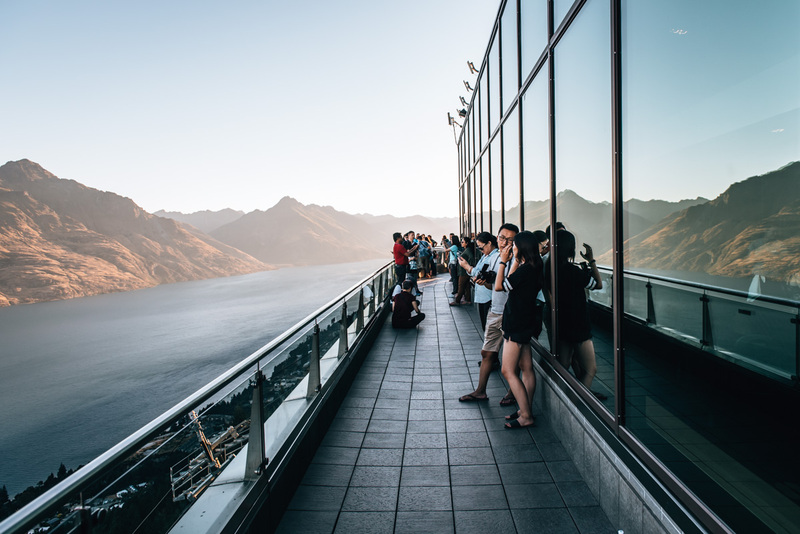 From the observation deck at the mountain station you have a beautiful view of Lake Wakatipu and the Remarkables. The Skyline Gondola station is located in the middle of the town centre. You can easily reach them by foot. A little heads up: We found the viewing platform rather overcrowded this time. Just know that the gondola is perhaps the most touristic attraction in Queenstown. If you have time, then it might be worthwhile to move away from the crowd and wander around the mountain. A highlight for ambitious hikers should be the Ben Lomond track, which starts from the mountain station. Incidentally, on our first trip to Queenstown a few years ago, we did not use the gondola and actually hiked all the way up to Bob’s Peak. You should give yourself a good hour for the roughly 400 meters elevation. The trail (“Tiki Trail”) starts directly behind the Skyline Gondola station and then zigzags through the forest upwards. 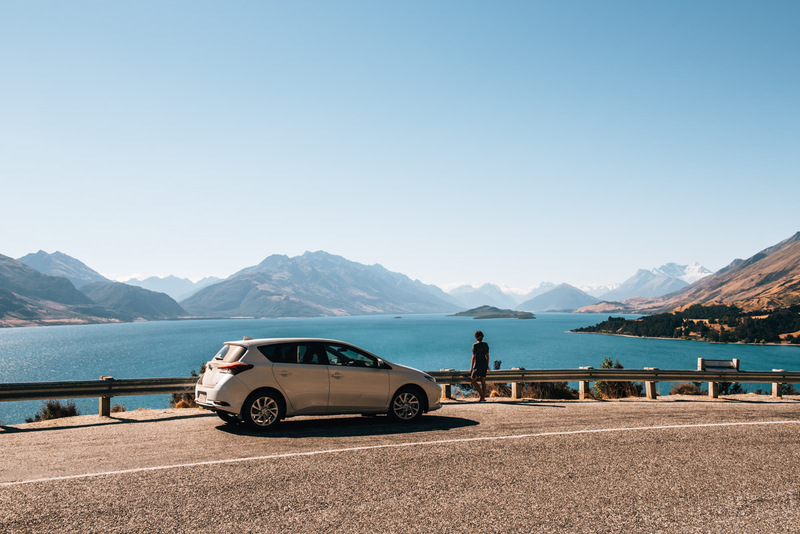 The winding roads from Queenstown along the shores of Lake Wakatipu to Glenorchy is said to be one of the most beautiful drives in the world. We cannot object. The landscapes as you drive along is absolutely gorgeous. It takes about 45 minutes by car from Queenstown to Glenorchy. It may well be that we took longer, as the road is so photogenic that we wanted to stop every hundred metres for a photo. Apart from the beautiful journey, the small hidden gem of Glenorchy is really worth seeing. We were here in the afternoon and spent our time right on the lakeshore. The weather was so good to us that day, we both ended up swimming several times and best of all, the water was warmer than we expected. One of the biggest craze in Queenstown is the burger shop called Fergburger. Years ago, the guests stood here for the coveted burger queue. This has not changed at all. 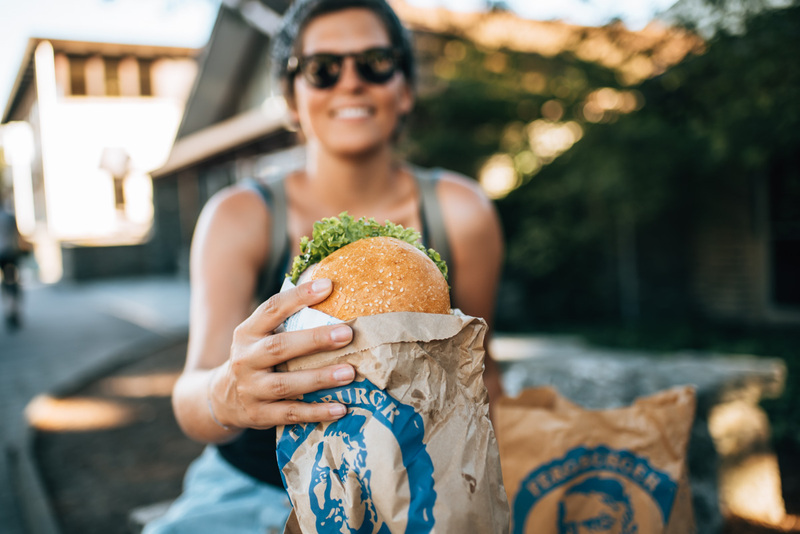 In fact, if you go during peak lunch/dinner time (and especially in the high season), then expect to wait half an hour or more until you finally get your burger. Also there is very minimal seating here – you have to either be very lucky or very patient. Most people just pick up their burger here and then eat it down by the waterfront. The menu is unfortunately very meaty (as you would expect from a Burger House) but the good news is, they have two vegetarian burgers on the menu and they even cater to Vegans on request. In terms of price, most of the burgers are between $13 and $15 NZD. Our conclusion: even if it goes above our heads, why we and so many people are willing to make a trip to Fergburger and wait so long… we cannot deny that the burgers are one of the best we have ever had. Right next to Fergburger is their partner bakery: Fergbaker. Here you can get delicious coffee, croissants, cakes and sweets as well as bread and pies. And best of all, without a line – usually. At Fergbaker we liked to get either a quick breakfast or a flat white. As if this was not enough, the Ferg empire completed their trio by opening an adjacent ice cream parlour “Mrs Ferg”. Unfortunately, we have not tested the ice cream, but it’s said to be very good. Our breakfast heaven! We had a delicious breakfast at Vudu Cafe & Larder, which offers a very cool atmosphere. The very popular cafe is a bit hipster, a bit retro and mostly very crowded. As with most places in New Zealand, orders are placed at the counter first. By the way, the Oat Granola was especially good. It’s not that easy to find cheap and good accommodation in Queenstown. The prices here are very above the average. We spent two nights at the Amity Lodge Motel and were very happy with it. 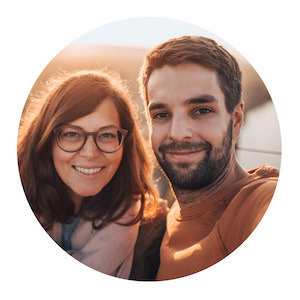 The small apartments are very spacious, comfortable and rather modern – the owner is incredibly friendly and has always given us great advice. The motel is pretty central, only 10 minutes walk to the town centre. Parking was also available. All in all a very good value for money and happy to recommend. Queenstown is scenically soooo stunning that even the arrival and onward journey are a highlight of the trip. From Wanaka we can recommend you drive to Queenstown via the Crown Range Road (Cardrona). The route is incredibly spectacular. Many travellers stop in Arrowtown, which is a small, former gold mining town – although it is becoming very touristy, a short walk around is worthwhile. However, Wanaka deserves more than just a short stopover. We fell in love immediately with this cozy township situated by Lake Wanaka. There are also lots of beautiful hikes in this area, one of which is the well photographed Roys Peak Track. On the way to the glaciers (Fox and Franz Josef) we recommend you stop at the Blue Pools along the Haast Pass. Only a 15 minute walk through the forest you will reach a suspension bridge that leads you to the sparkling blue pools. This blog article contains our personal recommendations in the form of so-called affiliate links. If you book or buy something via the links, we will get a small commission. For you, this does not change the price one bit. How great is that? For our rental car in New Zealand, we received a small discount from Sunny Cars – thank you Sunny Cars! However, this does not change or influence our opinions at all, as we have booked several times through Sunny Cars in the past (with full price paid) and always had a good experience. 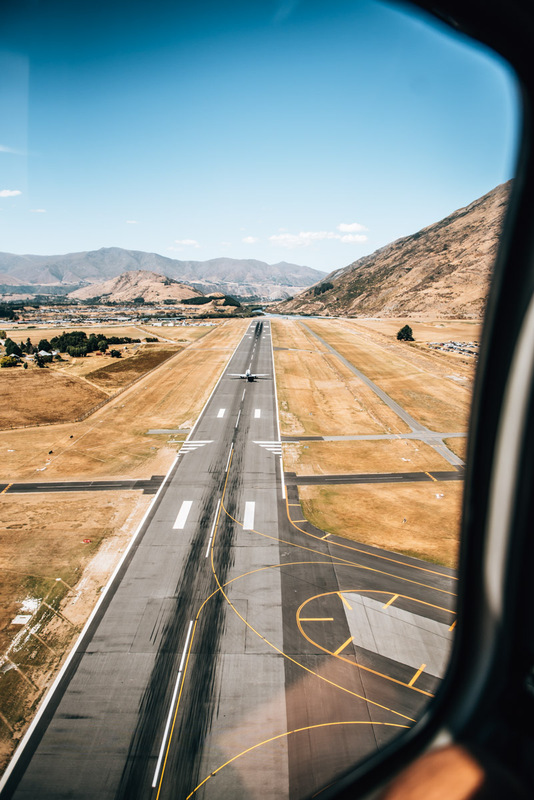 Have you ever flown over Queenstown with a helicopter or is it something you’d like to do? Do you have more tips for Queenstown or questions for us? As always, we look forward to your comments below!